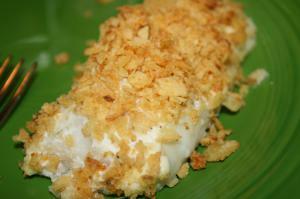 Chip-crusted cod, what's not to love?! :) Adapted from a Cooking Light recipe. Arrange fillets on a parchment-lined baking sheet. Brush 1/2 teaspoon mayonnaise over top of each fillet; sprinkle evenly with salt. Gently press about 2 tablespoons crushed chips evenly on top of each fillet. Cook fish at 400? for 10 minutes or until fish flakes easily when tested with a fork. Serve with ranch dressing. Stacy's Notes - made January 2012 from a recipe I saw at Cooking Light's website. I used 2 fillets for us, the olive oil mayo I always have on hand, and a nice amount of crushed salt and vinegar kettle chips (I don't measure, just crush some from a big bag). I don't use the ranch dressing, but make up a tartar sauce for the side. I've served these with fries, kale chips and veggies, for a nice healthy meal.